Kerseys is about to hold an exhibition entitled Art of The Law, kicking off on the 19th of February. I hope as many people as possible are able to catch it. There are some amazing art works on the legal theme. Here is the link if you want to book a place at the Opening View. You might think that art could not get into law. I hope this exhibition proves to you otherwise. But a couple of recent cases prove that it can also happen the other way around. Sometimes the law gets into art, as shown by a couple of stories which have hit the news recently. The first case is about a Mr Thwaytes who sued the Auction House Sotheby’s. He sold a painting entitled ‘The Cardsharps’ which was catalogued as by ‘a follower of Caravaggio’ for £42,000 in 2006. The following year the new owner claimed it to be by Caravaggio himself. He insured it for £10 million. Mr Thwaytes was described in the court papers, perhaps by way of understatement, as being ‘understandably upset’. He sued Sotheby’s for professional negligence in assessing the work. But there are limits in law as to how far a professional has to go to be negligent. Sotheby’s Old Masters specialists were held by the judge to be ‘highly qualified’. They had examined the painting ‘thoroughly’. They reasonably concluded that the quality of the painting ‘was not sufficiently high to indicate it might be by Carravagio’. There is already at least one original of ‘The Cardsharps’ which is displayed at Kimbell Art Museum in Texas. Artists are not averse to painting the same one again if they think they are on to a good thing. However, interestingly, the court came to no conclusion, it would seem, as to whether it was actually an original Caravaggio or not based on the evidence, which might have made Mr Thwaytes’ task even more of a struggle. Sotheby’s did not guarantee the painting’s provenance. However, conceivably its value might have been considerably enhanced if the odds of it being an original had been put a lot higher. But in fact, Sotheby’s had done its best and now Mr Thwaytes has two big legal bills to pay: his own and Sotheby’s. The second case also involved Sotheby’s coming up trumps again, although not a case this time in court so there is no legal decision. Christie’s valued ‘Salisbury Cathedral from the Meadows’ as by ‘a follower of Constable’, just in the same way as ‘The Cardsharps’ was valued by Sotheby’s as by ‘a follower of Caravaggio’. It was sold at Christie’s for just £3,500 in 2013. But this time the experts really did get going afterwards with very intrusive investigations. They did a lot of cleaning and came to believe that an amateur restorer had painted over an actual sketch made by Constable for his final painting. The sketch has now been valued by Sotheby’s at £2 million. 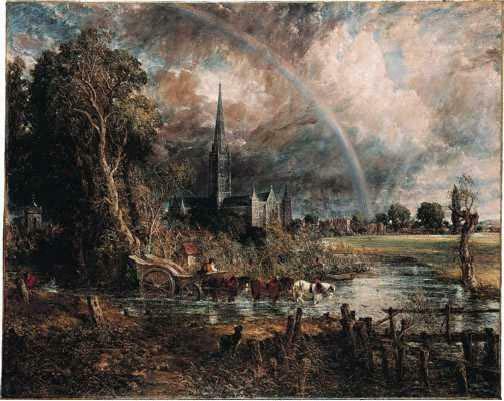 The original painting ‘Salisbury Cathedral from the Meadows’ has just come to Ipswich on loan for a year from the Tate. It’s now at Christchurch Mansion! So do check that out.